From March 7th to 12, SEYI Exhibited “Enriching Life through Innovation and Technology” at TIMTOS 2017. This exhibit showed how new servo technology and intelligent machines can be helpful to optimize the daily-used products in human life. SEYI focused the Booth at TIMTOS to show how we can help businesses adapt to the Industry 4.0 trend. 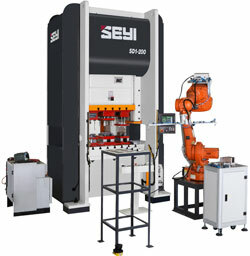 To respond to the market trend and the new generation of completely intellectual manufacturing system, SEYI continuously improves the green and intelligent servo press, upgrades straight side large crank press, integrates automation system, and develops “Intelligent Press Line Management System” for better intelligent manufacturing solutions applied to metal formability. If you wish to know more about our solutions or successful case stories please contact us. SEYI partnered with international leading industrial robotics supplier ABB, offering customers professional metal stamping automation solutions. Industrial applications and metal stamping materials are developing at an amazing speed. Besides improving the designs and functions of both mechanical and servo presses, SEYI is currently working strategically with ABB to be able to meet their client’s needs. Offering solutions like one press with one robot, one press with multiple robots, or multiple presses with multiple robots will allow customers to complete automatic production solutions. In addition to this SEYI will be applying their “Intelligent Stamping Line Control System”, developed in-house, to offer more advanced metal stamping solutions that lead to the advantages of intelligent production. “In this transforming age of manufacturing it is unavoidable for operators to work with industrial robots. Robots spare operators from repeated and risky work, while greatly increasing the quality of stamped parts and productivity. Through the years, ABB has been an important partner for SEYI in developing automation systems. With the increasing customer requirements for automation, we have solid faith that win-win outcomes can be expected based on the cooperation between ABB and our company.” Chairman and CEO Ms. Claire Kuo said with great confidence. SEYI’s SDE Straight Side Eccentric Gear Servo Press series won 2017 Ringier Technology Innovation Award – Metalworking Industry (one of the most influential industrial awards in China). After a 5-month nationwide entry and nomination, serious review, evaluation and the voting process, SEYI’s SDE series stood out from 110 entries. We will be at the forthcoming MACH 2018 Exhibition to be held at the NEC, Birmingham from 9th to 13th April. Our stand number will be H20-7. PressCare had an excellent MACH 2016 exhibition and we were very pleased to welcome a large number of both new and existing customers onto our stand, some of whom had flown into Birmingham especially to visit the stand and discuss new projects with our engineers. With the expert assistance of representatives from SEYI Presses Europe, who had once again kindly joined us for the week from their headquarters in Hanau, Germany, we ended the week with a considerable number of very promising enquiries, both for new SEYI presses, coil handling equipment and also for upgrades to existing machines. The show came at an extremely busy time for us coinciding with a number of large projects, most notably the installation of a new SEYI SLG 800 straight sided link drive press for Denso Marston in West Yorkshire - a project which came to fruition this year as a result of contacts made at the preceding MACH 2014 show. At the same time we were also in the initial stages of installing a new SEYI SLG 500 straight sided link drive press for Donaldson Filtration in Poland and an SNS2 400 straight sided press for Temac Automotive in the Czech Republic. 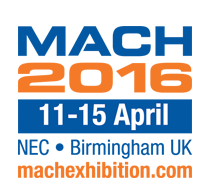 PressCare & SEYI will be at the forthcoming MACH 2016 Exhibition to be held at the NEC, Birmingham from 11th to 15th April. Our stand, number 4548, will be part of the Metalworking Machinery Manufacturers Association (MMMA) Village located in Hall 4. 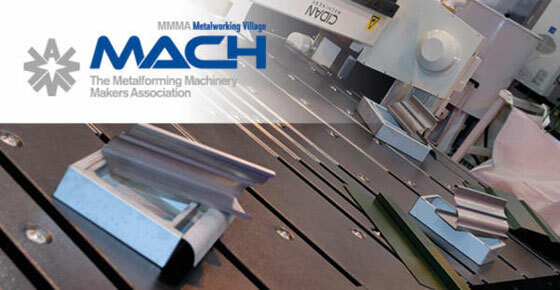 MACH is widely regarded as one of the most important exhibitions in Europe for manufacturers and suppliers of machinery for the metalworking industry and as such attracts visitors from all over the globe. Please come and visit us on stand 4548 - We look forward to seeing you! PressCare & SEYI will be at the forthcoming MACH 2014 Exhibition to be held at the NEC, Birmingham from 7th to 11th April. Our stand, number 4633, will be part of the Metalworking Machinery Manufacturers Association (MMMA) Village. 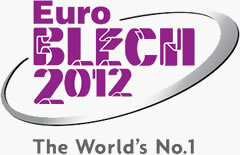 Please come and visit us on stand 4633 - We look forward to seeing you! SEYI launches its new line of single point and double point servo presses in Europe. Offered from 80T – 400T, they are equipped with the most up-to-date direct drive servo motor and control technology, designed specifically for servo forming applications. The servo motor offers three times the torque than the current market’s servo motor, and 30% higher torque than other direct-drive servo presses. The state-of-the-art servo direct drive technology eliminates down-gearing, belts and unnecessary linkages and has shortest distance of transmission of any manufacturer, helping to maximize torque distribution. A user-friendly Point-On-Demand (P.O.D.) controller provides 8 preset stroke profiles such as pendulum strokes, multiple hits in one stroke, and extended dwell time, as well as free-hand programmability. SEYI’s unique energy-saving storage system eliminates the issue of higher power requirements and power surges. SEYI Servo press frames are engineered with a ribbed frame construction, offering more rigidity - especially during longer dwells - and less deflection. The hydraulic overload has been removed and replaced with an electronic overload, providing more stable protection when working closer to rated tonnage for long periods of time. The electronic overload is also programmable. Servo presses have gained increasing popularity in the past five years. By combining the advantages of a hydraulic press’s fully programmable slide stroke with mechanical press speeds, manufacturers can control tonnage, speed and dwell at any point of stroke, making it possible to form more complicated geometric parts, exotic materials, and eliminate secondary operations. Dwell profiles can be programmed to eliminate material spring back in hi-tensile matierals and produce higher quality parts. You can program fast ram speeds at die-closing and die-opening segments, and slow ram velocity during the working portion of a stroke, and achieve higher production rates while reducing reverse load, prolonging die maintenance cycle time, and reducing stamping noise and vibration.